This guide was produced for Serious Eats as part of our partnership with Anova, the makers of the Anova Precision Cooker. You can download the Anova Precision Cooker App (it’s free) to grab all this information right off your phone or tablet while you’re cooking. And, if you’ve got an Anova Precision Cooker, you can even control it directly from the app via Bluetooth or WiFi. Of course, this information should prove useful to anyone who owns a functional sous vide device. Pork is a popular meat for barbecue because it’s so darn easy. Pork shoulder is easy. Sausages are easy. Even pork ribs are pretty easy. But follow that smoke trail west until you hit central Texas and you’ll find something that’s not easy: brisket. Good brisket is often called the Holy Grail of barbecue. This is an apt description, given how rarely you find good smoked brisket in the wild. I’ve tasted barbecued brisket all over the country, and, while you can certainly find some truly transcendent barbecued brisket, the vast majority of the time, it’s a dry, bland disappointment. What makes it so hard? Two factors: It’s tough, and it’s lean. With traditional smoking methods, a pork shoulder will tenderize in a matter of hours, and it has tons of connective tissue and fat to help keep it moist as it slow-cooks. A brisket, with its tougher meat, needs to be cooked overnight to completely tenderize. Not only that, but there isn’t as much fat or connective tissue to lubricate dry meat when it’s finally tender. Unless you have either the experience or the luck to nail every single step of the process, moist, tender brisket exists only in the realm of dreams. Sous vide cooking changes all that by allowing even a novice to produce brisket that’s as moist and tender as the very best stuff you’ll find in Austin or Lockhart. I can already hear the barbecue purists moaning, But it’s not really barbecue! or What’s the appeal of boil-in-the-bag? or perhaps simply muttering into their keyboards, Sacrilege. It’s a fair point. Sous vide barbecue is not “true” barbecue, in the sense that we aren’t using hot, smoky air to slowly break down connective tissue and imbue flavor. But, with a bit of good technique, we can certainly come up with a dish that looks, smells, and tastes like barbecue. Not just any barbecue—really, really good barbecue. Barbecue that has a thick, crisp, near-black bark that gives way to meat that melts in your mouth, with a deep smoke flavor. And let’s be honest here: That’s better than what can be said for at least 98.3% of the “true” barbecue brisket out there (I did a count to verify that number). How many times have you had brisket that’s rubbery and tough? How many times have you had brisket that falls apart in your mouth like it’s made from sawdust? Yup, I thought so. Sous vide makes those scenarios a thing of the past. For many folks, sous vide offers convenience. I personally don’t have a smoker capable of maintaining a nice low temperature without being monitored, which means that if I want to smoke a brisket the right way, I’m camping out overnight in my backyard, with a thermometer and an alarm to make sure I keep that fire at the exact right level throughout the night. This is fun to do when there are friends and beers involved, but it’s not something everyone is willing to do every time they get a hankering for brisket. With sous vide cooking, there’s no babysitting required. Set the water bath to the right temperature, drop in the meat, walk away until it’s cooked through, then finish it off on the grill or in the oven when you’re ready to serve. What Temperature and Timing Should I Use? Depending on the temperature to which you set your water bath and how long you leave the meat in it, you can achieve a wide range of textures in the finished brisket. At 135°F (57°C), brisket will never achieve the fall-apart texture of a traditionally barbecued brisket. Instead, it will soften while retaining its structure. After 12 hours, it’s still quite tough. After 24, it’s as tender as a New York strip steak. 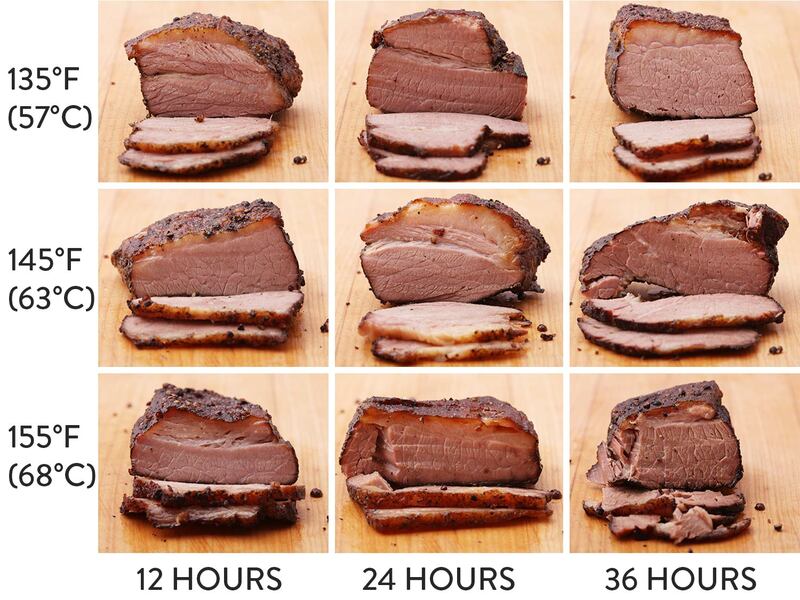 After 36 hours, it’s even more tender, and, by 72 hours, you’ll have brisket that can be cut with a spoon, while still giving you a meaty bite and juicy texture. At 145°F (63°C), the meat will just barely start to separate into a traditional brisket grain, but it will be a little drier than it is at 135°F. This is sort of a temperature dead zone for me: too cool to significantly break down muscle fibers to the point that they shred like traditional brisket, but hot enough that the meat will dry out as it cooks. Brisket cooked over a real Texas-style hardwood pit gets a thick, black bark with a smoky flavor. To get that bark at home, we can finish the brisket either in the oven or on an outdoor grill over indirect heat. Getting that smoke flavor in there is a bit trickier. Here are two methods. One way is to use the method I use for my indoor sous vide pork ribs: liquid smoke. A small shot of liquid smoke added to the bag before cooking the beef sous vide will give it a mild smokiness that captures most of the flavors of real outdoor cooking. (After all, liquid smoke is nothing more than the condensed contents of actual wood smoke—mostly the exact same condensates that are deposited on meat as it is smoked.) The liquid smoke approach is great if you’re finishing the brisket in the oven, but it will also work if you are finishing outdoors. Adding a smoked product, like smoked salt, to the rub can also give the beef a smoky flavor without any actual smoking in the process. If you’ve got yourself a kettle grill or smoker, then you can enhance your sous vide brisket through a bit of honest-to-goodness smoking. I find that by letting my brisket cool a bit (or even refrigerating it for up to a week), I can place it on the cooler side of a kettle grill that I’ve heated to around 300°F with charcoal and wood chunks and let it smoke for a good three hours or so before it starts to dry out at all. 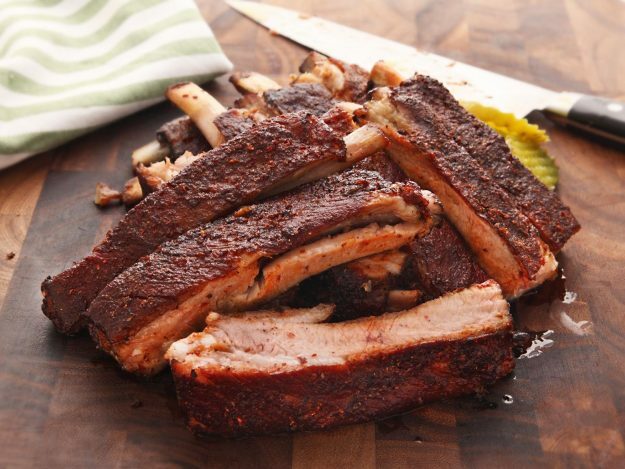 This is ample time to develop a deep, dark crust and to get some smoky flavor in there. Is it better to apply that smoke before or after cooking sous vide? Well, according to folks like Meathead Goldwyn, author of the eponymous book on the science of barbecue, the flavorful compounds in smoke will adhere to and penetrate raw meat much better than they will with cooked meat. This is true, but I find that the amount of smoke flavor I get out of a post–sous vide session in the smoker is plenty for my taste buds, and smoking at the end makes the process so much more efficient. I’ll stick to the post–sous vide smoke. What About the Smoke Ring? The smoke ring? You mean that pink ring of meat that appears around the edges of a well-smoked rack of ribs or brisket? Yeah, what about it? Here’s the fact: The smoke ring is purely cosmetic. That’s right. It signifies absolutely no guarantee of smoke flavor or proper cooking. The smoke ring appears due to the interaction of carbon monoxide (CO) and nitric oxide (NO) with myoglobin, the natural pigment that makes meat red (a close relative of hemoglobin, the red blood pigment). As meat cooks in an environment rich with carbon monoxide and nitric oxide, its pink color becomes “fixed,” preventing it from oxidizing and turning into metmyoglobin, the brown pigment you see in cooked (or old) meat. A red “smoke” ring will appear in any environment in which meat is slow-cooked in the presence of CO or NO, whether or not any smoke is involved in the process at all. For some deeper science on the smoke ring, I highly recommend reading this great myth-busting article on the smoke ring from AmazingRibs.com…..
Next PostRanch dressing on Pizza?